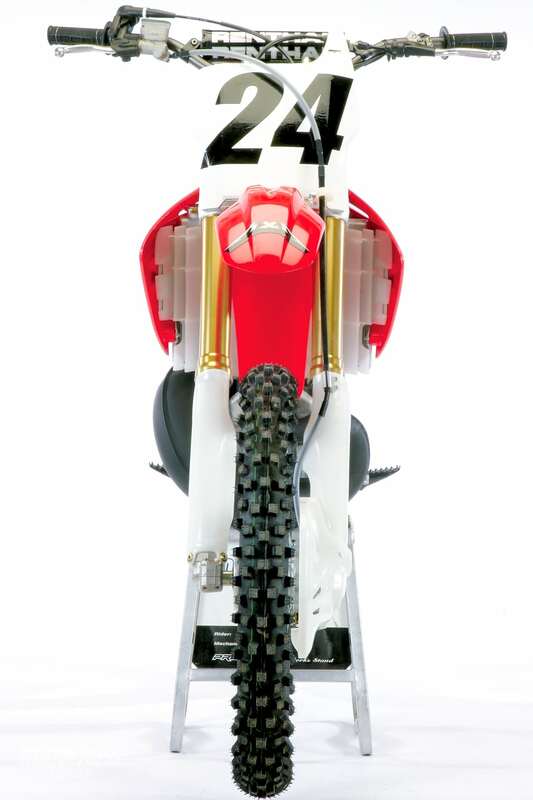 This is an archived 2005 Honda CR250 MXA test from the February 2004 issue of Motocross Action Magazine. Get your MXA subscription today. Honda, bless their souls, rolled the dice in 2002 with a case-reed engine. If that wasn’t brave enough they went for an electrically manipulated (and electronically controlled) power valve. They were brave, but history has proven that that these big gambles didn’t pay off. Three years later, Honda is still trying to get more out of the stuffed lower-end. Not only has it not had enough bottom, but the engine has lacked the forgiving over-rev that is de rigeur on modern motocross engines. Never give up the ship! Honda has revised the CR250’s case-reed engine again in an attempt to make the 2005 CR250 competitive with the latest generation of YZ-clone engines from Yamaha, Kawasaki and Suzuki. Were they successful? Read on. 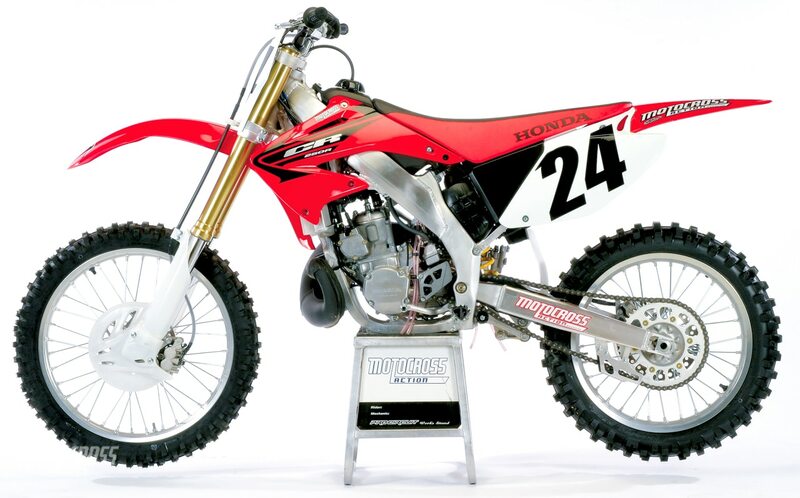 Q: IS THE 2005 CR250 ENGINE FASTER THAN THE ’05? A: Yes, it is faster. Honda managed to get a more manageable powerband out of the less than stellar CR250 engine design. Q: WHAT HAS BEEN WRONG WITH PREVIOUS CR250 POWERBANDS? Every year Honda vows to make next year’s bike bark. Every year they fail. For 2005 they didn’t fail…as much. 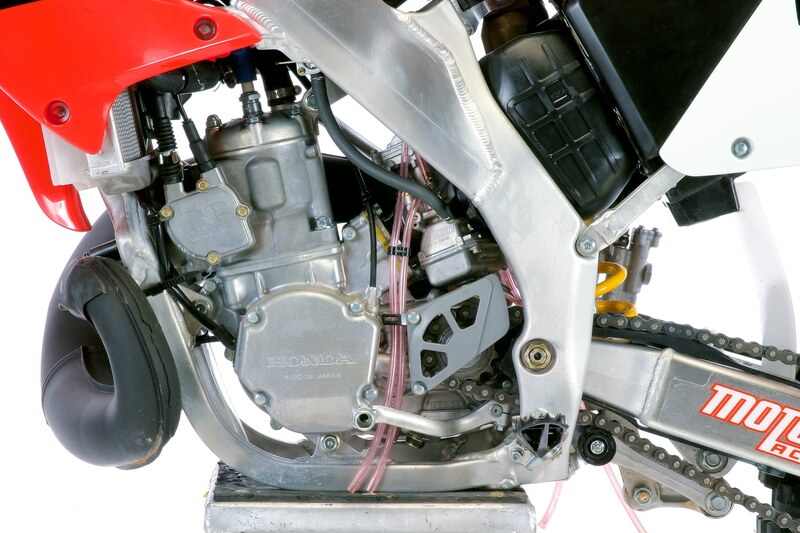 Q: WHERE DOES THE 2005 HONDA CR250 ENGINE EXCEL? A: When the MXA test crew ran the ’05 Honda on the dyno it blew our socks off. All kidding aside, the 2005 CR250 produced the most low-to-mid power of any deuce-and-a-half that we’ve ever run on the dyno. It made two more horsepower than the class leading 2005 YZ250 at 6000 rpm, three more at 7000 rpm and one more at 8000 rpm. Amazing numbers. Phenomenal numbers. Unbelievable numbers. Our dyno run was so impressive that we didn’t believe it. So, we got a second ’05 CR250 and ran it. The result was the same. The greatest dyno engine of all-time. Peak horsepower was very good—not the best in 2005, but definitely near the top. Overrev was very weak, but with these kind of dyno numbers there would be no need to rev the ’05 CR250 out. Q: WHAT IS THE STRANGEST PART OF THE CR250 POWERBAND? A: The dyno numbers were an illusion. Every test rider, and we used six test riders on the ’05 CR250, complained that the bike was not very strong down low and that it took its sweet time about getting on the pipe. Imagine our surprise. On paper the CR250 should have dug a trench at low rpm, but instead of going “braapp” it went “wahhhhh.” On the positive side, it’s no longer a three “wah” engine, but it isn’t a Doberman Pinscher either. Once it got across the low-end blahs, it pumped out the ponies. The clutch was a big help in keeping the powerband above the no-man’s land. Q: WHY IS THE CR250’S LOW-END SO BLAH? A: We live in an electronic age. Every thing that can be managed by a microprocessor is equipped with one. The CR250 would make Bill Gates and Paul Allen into motocross fans. It’s got ignition maps to handle every possible scenario—too many maps. Worst of all, in our opinion, is the electric power valve. It doesn’t seem to open fast enough for the every-changing conditions, throttle positions or rpm situations on the track. If we had our druthers, we prefer an old-fashion four-ball centrifugal power valve over modern electronics. We think that would help get the bike on the pipe quicker. 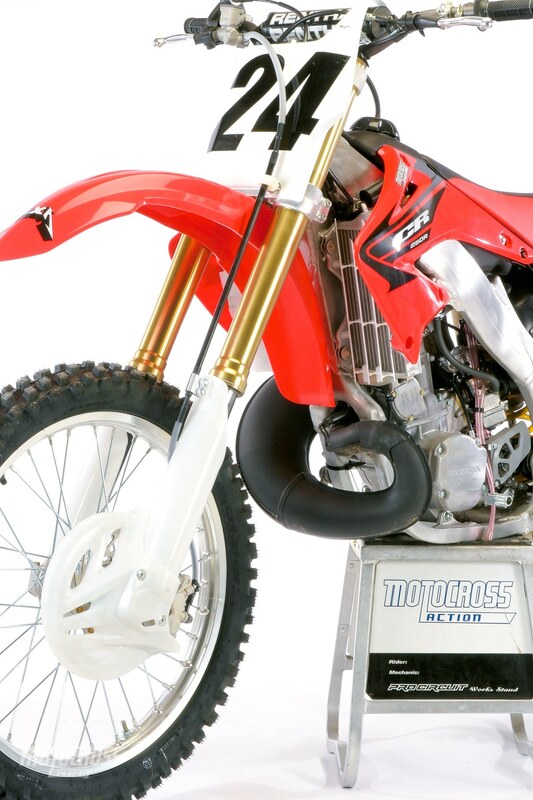 Q: DOES THE 2005 CR250 HAVE ANY HIDDEN SECRETS? We don’t know if the 2005 CR250 has traction control, just that they did in the past, but every test rider commented that under hard acceleration on hard dirt the CR250 would wheelie when other bikes were spinning. Q: HOW DOES THE 2005 CR250 REALLY RUN? power is mainly focused in the midrange (no matter what the dyno says) and it is no slouch. Once you learn how to get it across the lazy bottom, it romps. It’s snappy, responsive and quick. How does it compare to the competition. Midrange: The middle it is terrific. It gives no quarter. Low-end: Off the bottom, it can’t hold a candle to the YZ250 or 2005 KTM 250SX. Top-end: On top, it gives up a way too early. The best way to ride the 2005 CR250 is dead center. Use a touch of the clutch to keep it percolating, don’t overrev it on the long straights and, when you turn it on, turn it on all the way. Q: WHAT ABOUT THE CR250’S JETTING? A: We always felt that the CR250 was on the verge of detonating, but going up one main made it burble. We settled for bigger pilot jet (45 instead of 40). Q: WHAT ABOUT THE CR250’S GEARING? A: We geared it down (from a 49 to a 50). Lowering the gearing lessened the time spent at half throttle, which helped the CR250 stay out of the blah zone (which was most noticeable when shifting from second to third). Q: WHAT ABOUT THE SHOWA SUSPENSION? 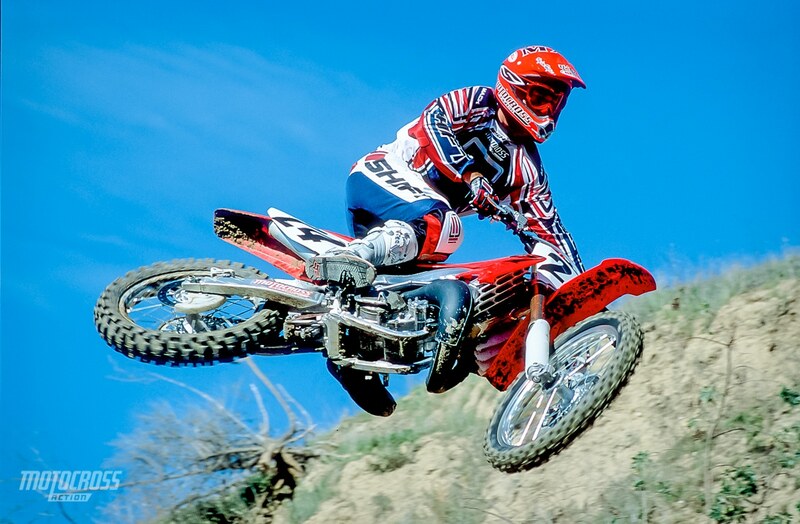 A: Every MXA test rider loved the 2005 CR250’s suspension. It was a revelation. Forks: The forks have a nice feel, ride fairly high in the stroke (especially compared to previous Showa forks) and are well sprung. The stock fork springs are 0.44 kg/mm (Pros might be tempted to go to 0.45s). Our best setting was with the compression on 10 click out and the rebound on 14 clicks out. We did add about 5cc of oil to the front forks because they had a tendency to bottom too easily. Shock: Honda’s rear suspension is first-rate. We set the low-speed compression on 7 click out, the rebound on 7 clicks out and high-speed compression at 2.5 turns out. The only thing we did that was a little out of the ordinary was to run the race sag at 105mm. A: The best handling Honda was the 1993 model. It was quick, agile and accurate. But, it did exhibit a considerable amount of head shake, which led Honda’s engineers to attempt to mellow it out for ’94. Unfortunately, it never handled as well again, a problem that was aggravated by the first and second generation aluminum frames (from 1997 to 2001). The third-generation alloy frame, still in use today, was an improvement. Gen-3 was a step up in resilience, fit and feel. Which brings us to the 2005 frame. The only difference is that Honda pulled the front axle back 2mm. It’s a noticeable improvement—especially at turn-in. Where last year’s chassis would hunt-and-peck before committing to direction changes, the ’05 frame takes an immediate set. We loved it. Don’t let anyone tell you that a couple millimeters of trail don’t make a difference. They do. (1) Vibration: It might as well say “Maytag” on the gas tank. (2) Air filter: Honda’s air filter is the exact same size as the airbox. That isn’t as good as it sounds. (3) Gearing: Gear it down or live in the “blah zone”. (4) Radiators: We can turn the rectangular radiators into trapezoids with our knees. (5) Electric power valve: Watch the cable tension on the electric power valve like a hawk. Obviously the dyno likes the way the power valve opens, but MXA test riders don’t. (1) Handlebars: You can’t complain when a bike comes stock with Renthal 971s. (2) Tires: We like the Dunlop 756 rear. The front 742 is a little too narrow-focus for our tracks and tastes. (3) Suspension: Good stuff right out of the box. 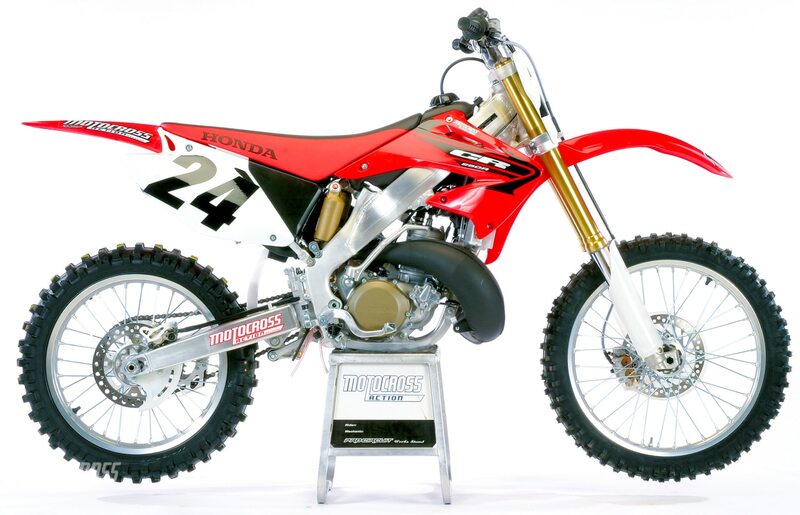 A: We wouldn’t be lying if you told you that we had our doubts about Honda releasing a 2005 CR250. So, we are pleasantly surprised that they not only produced one, but took the time and effort to try and fix it. It’s a better Honda, but not the best 250cc two-strok on the track in 2005.